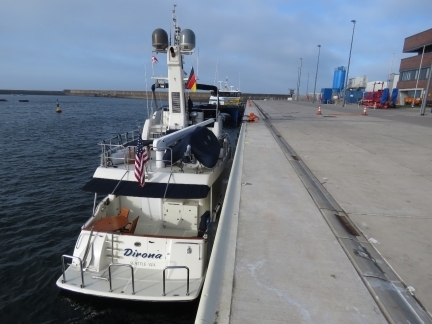 From the Netherlands we made a 500-mile, 3-night run to Norway with a pitstop in Helgoland, Germany for duty-free fuel. Conditions for the first two days were wonderfully calm and for the final night were rough in tight seas on the bow with pitching to 20.5° as we closed on the Norwegian coast. 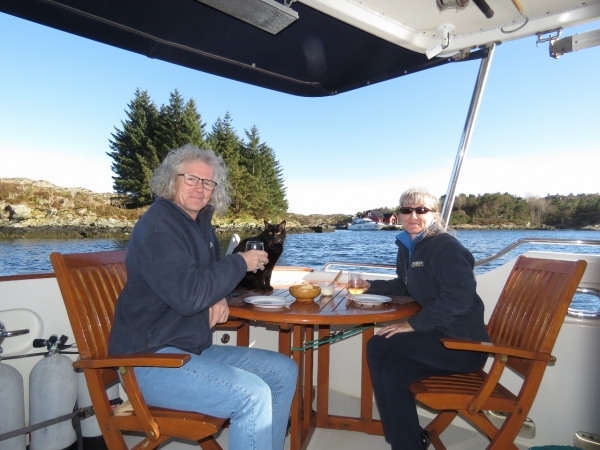 But we soon were in calm seas again as we entered Norway’s “Inside Passage” near Stavanger and enjoyed our first Norwegian anchorage. 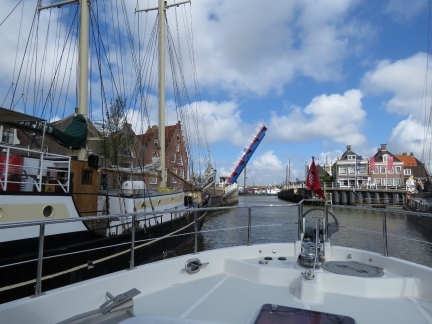 The bridge across the entrance to Zuiderhaven opening for us as we depart Harlingen. The stop to pick up our new tender was successful, and we really enjoyed the time we spent in and around the city. 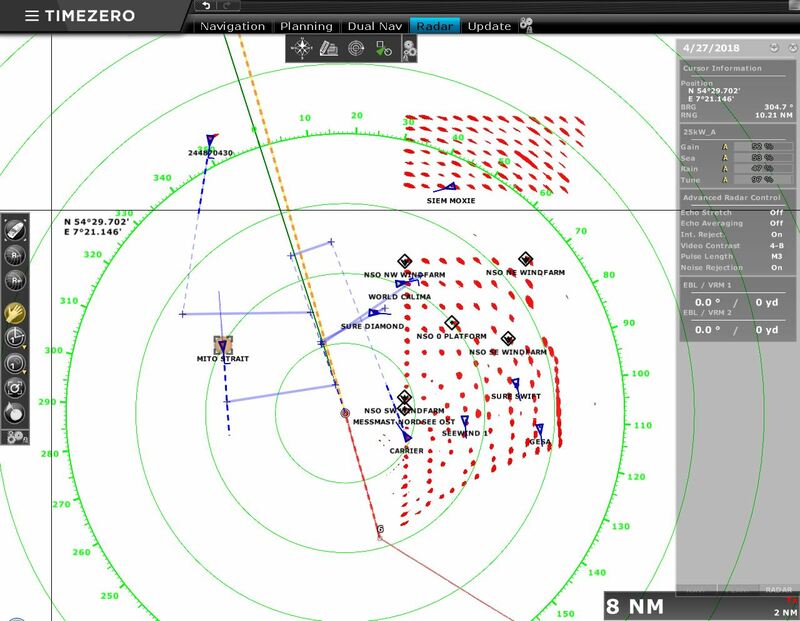 We’re running just south of the busy traffic lanes north of the Netherlands and can see lots of ship AIS targets there, plus several oil rigs. 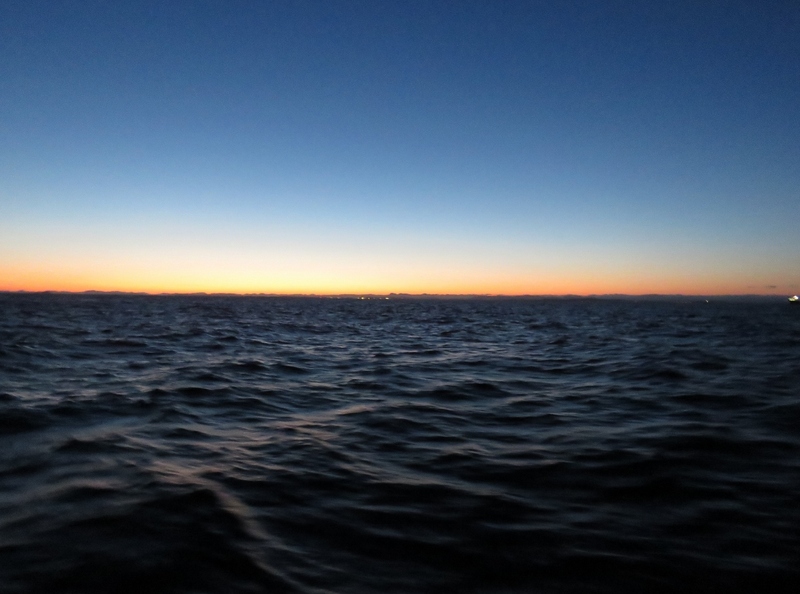 As we expected, conditions settled right down once we turned to sea and put the wind behind us. It’s still blowing 25 knots, but maximum pitch is now only 4° with max roll at 8.9°. Much nicer. 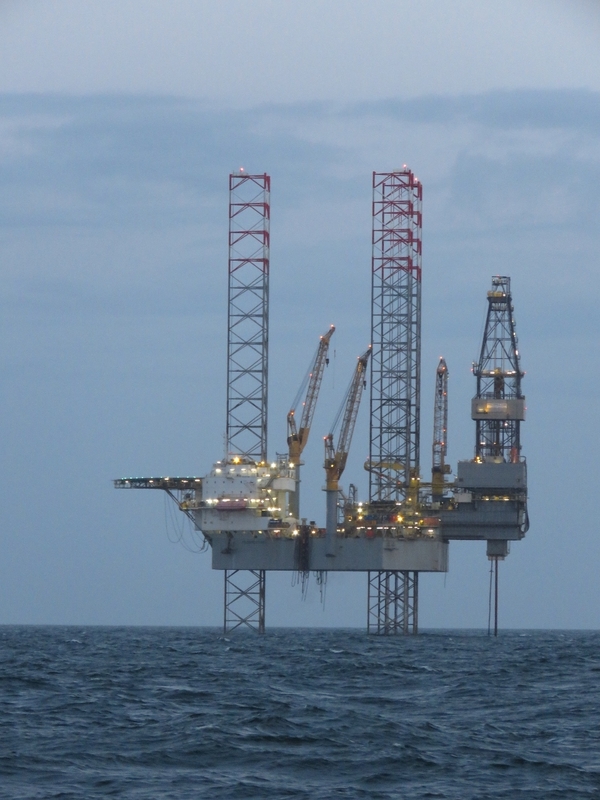 One of the many North Sea oil rigs we’ve passed, lit up at dusk. The light is poor, but you can just make out the wind farm and get a sense for the scale. 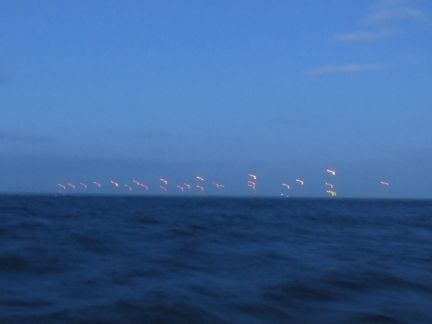 Each light is a multi-megawatt offshore windmill. 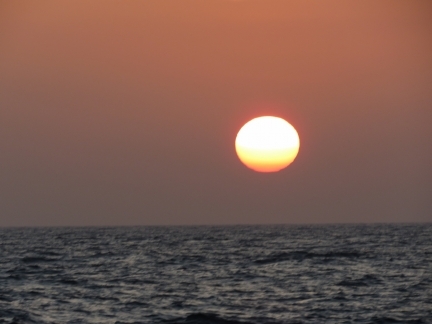 A beautiful sunrise after a wonderfully calm night at sea shortly after we’ve turned north toward Helgoland, Germany. 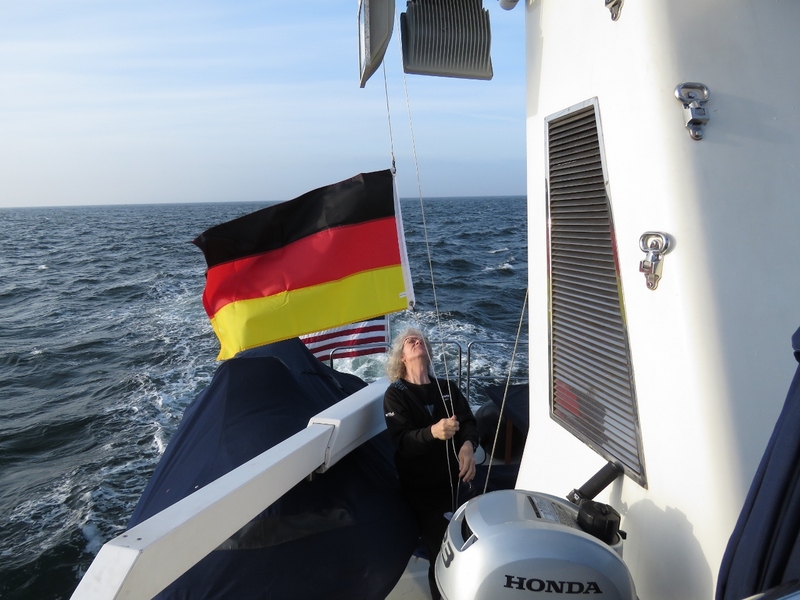 Raising our German courtesy flag in preparation for landing in Helgoland, a small archipelago about thirty miles off the German coast. 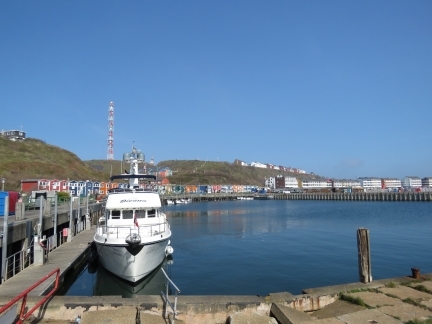 As a German territory, Helgoland is part of the EU, but is not part of the EU Customs Union or VAT area. We’re here at Bunker Station Helgoland to purchase duty-free diesel at a price of $4.81 per gallon. That’s a fair bit by US standards, but without VAT is cheaper than we’d have paid in the Netherlands or the UK. 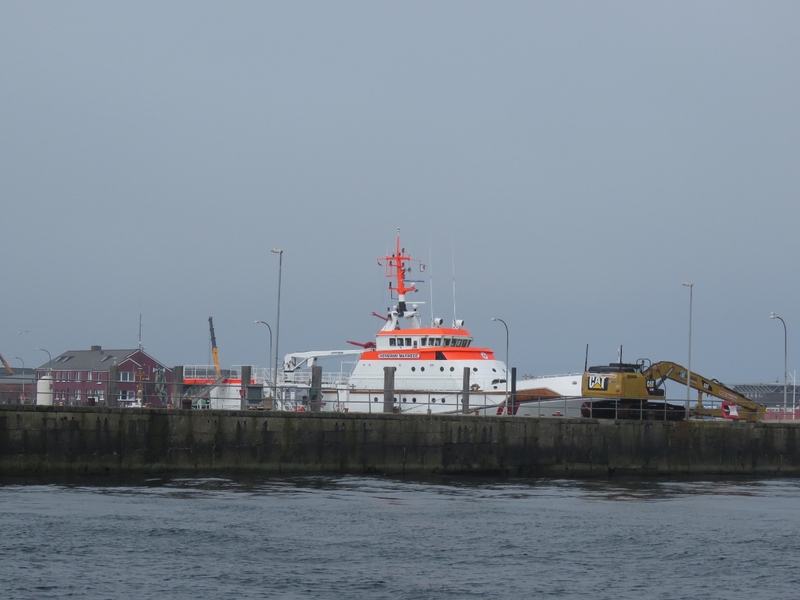 Docked at Bunker Station Helgoland’s Sudhafen facility. 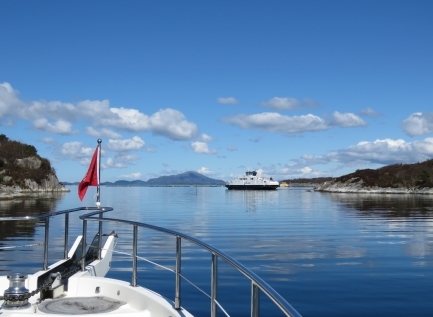 The dock has only been open a couple of years and caters mainly to commercial boats or those taking on at least 3,000L of diesel. When we were there, Sudhafen was available for pleasure craft until 10am daily and was booked for commercial traffic after. 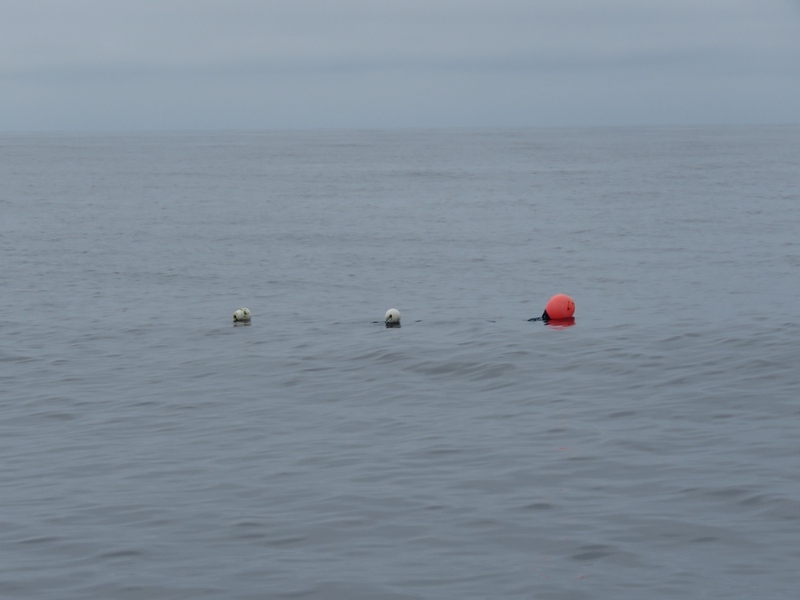 The bollards are so far apart that we ran aft and stern lines to one roughly amidships. We could have used our 75-ft lines and reached the farther bollards, but it didn’t seem worth the trouble. 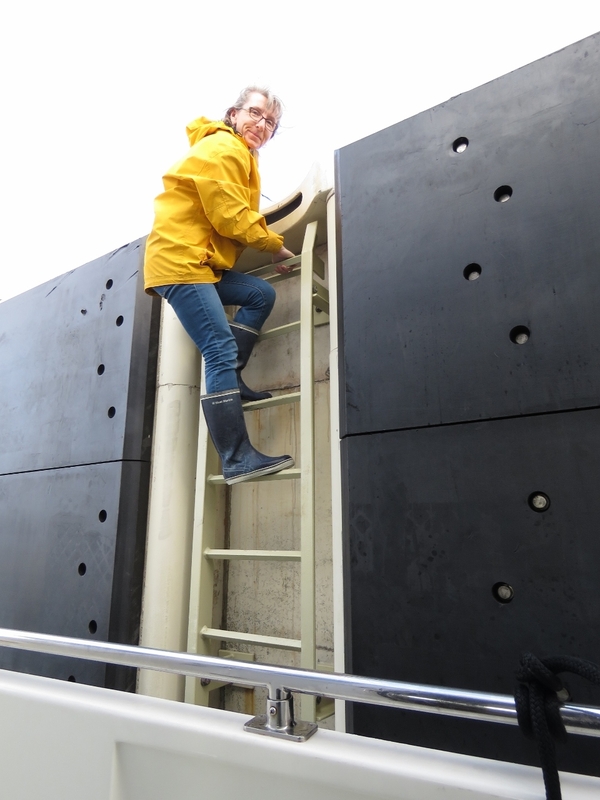 Jennifer climbing down the ladder back to the boat after tying off. It’s a long way up. 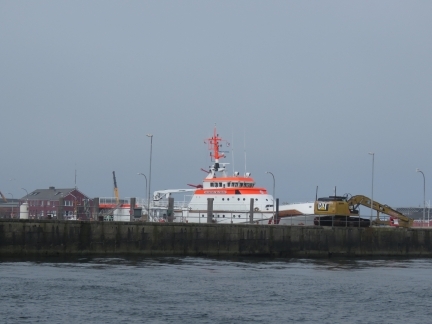 Taking on 940 gallons of diesel from Bunker Station Helgoland Sudhafen. The stop was super-efficient—we arrived at 8:10am, were fueling by 8:20 and were done and paid up by 9:30. 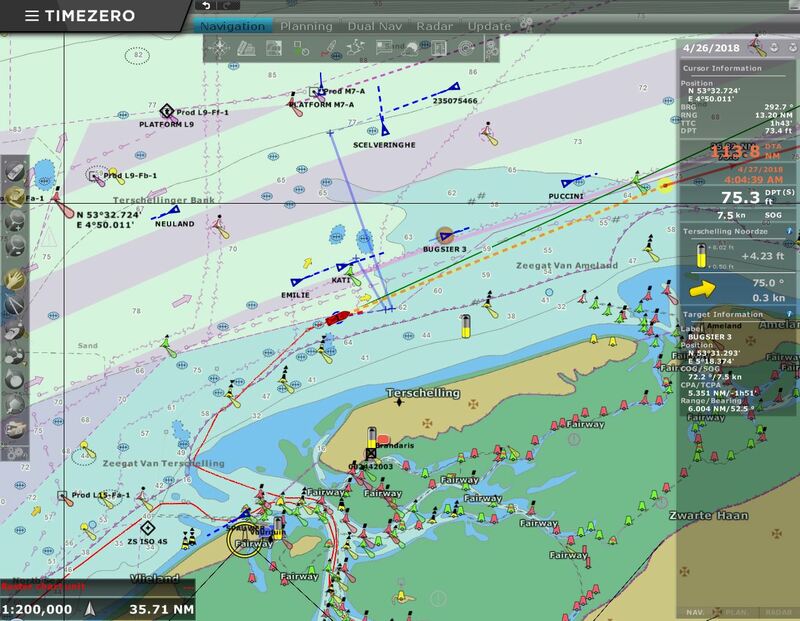 The 46m Hermann Merwede, based at Helgoland, is the largest in the German Maritime Search and Rescue Service’s 46-vessel fleet. Gasoline is only available at Bunker Station Helgoland’s facility in tidal-constrained Binnenhafen, so we moved there to fill our two 29-gallon deck tanks. 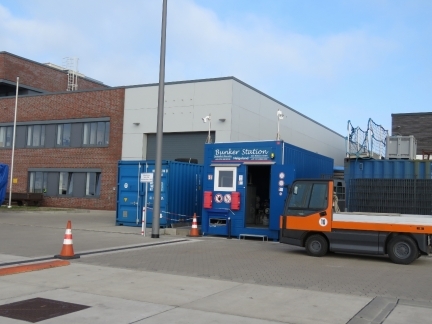 Until Sudhafen opened a couple of years ago, all the commercial traffic had to go here for diesel. 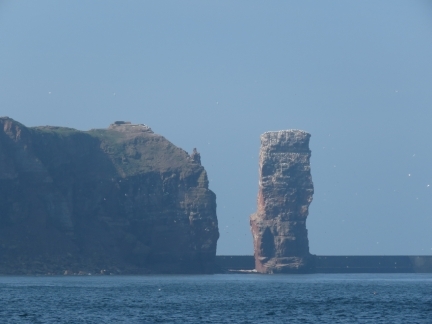 Langa Anna is a 154ft (47m) sea stack off the north end of Helgoland. Besides dramatic scenery, Helgoland is famous for being the site of one of the biggest single non-nuclear explosions in history when the Royal Navy detonated 6,700 tonnes of explosives there on 18 April 1947. Our initial plan was to spend a day or two exploring Helgoland before continuing on to Norway, but weather conditions looked good for the North Sea run, so we decided to just to a gas-and-go and explore Helgoland on a subsequent visit. 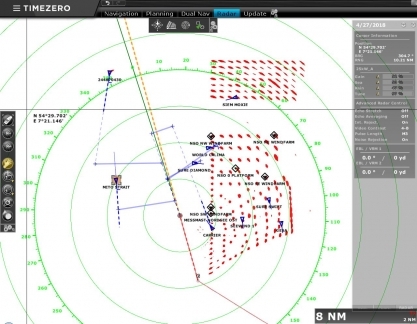 Passing around a grouping of three major wind farms: 302-MW 80-turbine Amrumbank West at the north end, 48-turbine 295 MW Nordsee-Ost at center and 880-turbine 288 MW Meerwind Sud/Ost at the south end. Three more wind farms are planned for the area. We picked up an AIS target travelling at 102 kts. It was the Danish search-and-rescue helicopter RDAF SAR4. 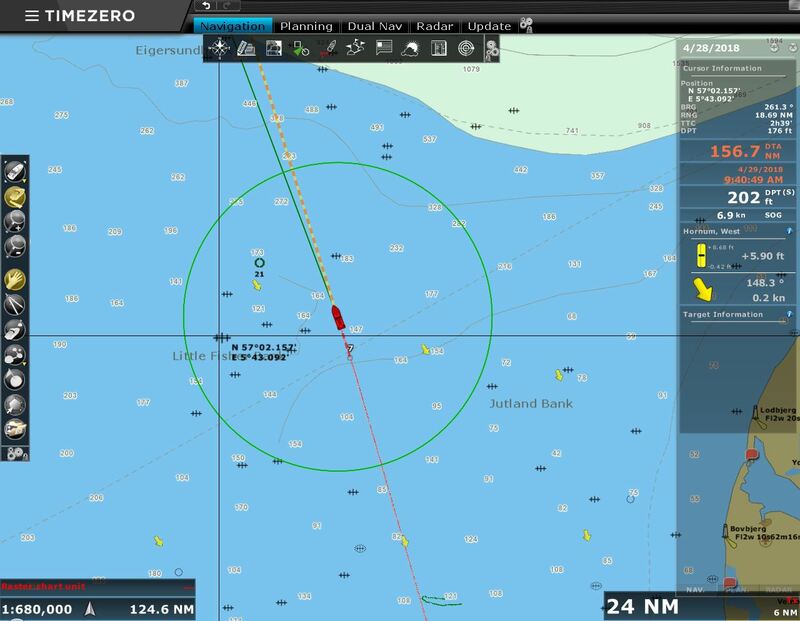 Conditions have been wonderfully calm so far on our run from Helgoland to Norway. We’ll take it while it lasts. Winds are forecast to pick up to 15-20kt from the north on our last night as we approach Norway, so we expect uncomfortable conditions for the final few hours. We passed the Horn Rev wind farm around midnight in a thick fog, so couldn’t see the lights from any of the turbines. 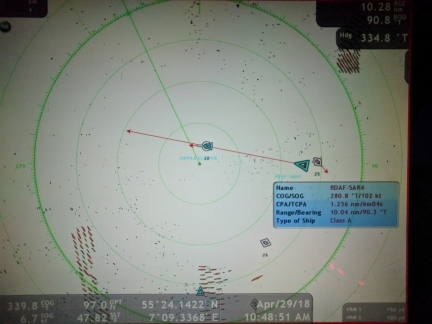 We also passed through some heavy traffic, with several fish boats, only visible on radar. Our forward spotlight reaching out into the fog. We really like the light, both to see and be seen, particularly in poor visibility. 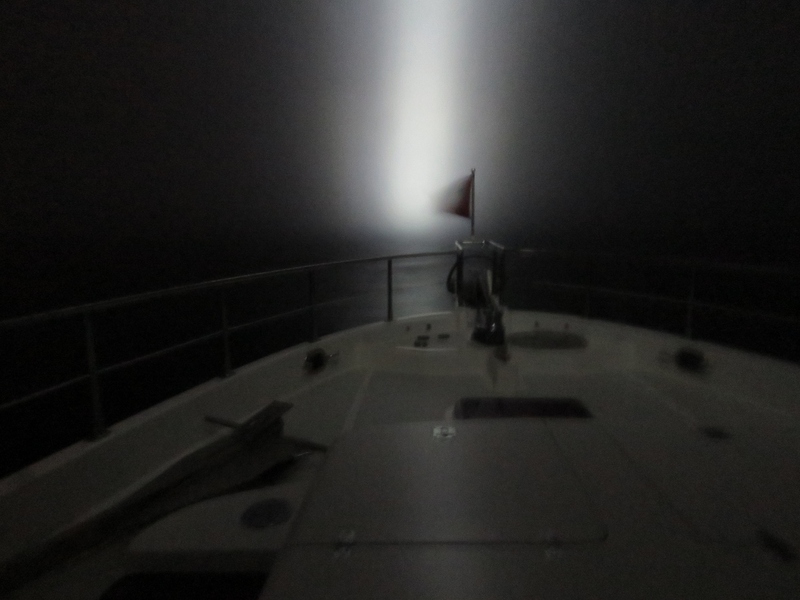 Our experience with fishing boats is that the floodlight can be seen from much greater distances, particularly in fog, than the navigation lights. 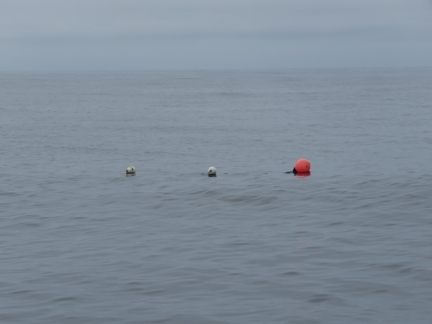 We’re a long way offshore, but traps can be placed almost anywhere in the shallow North Sea. 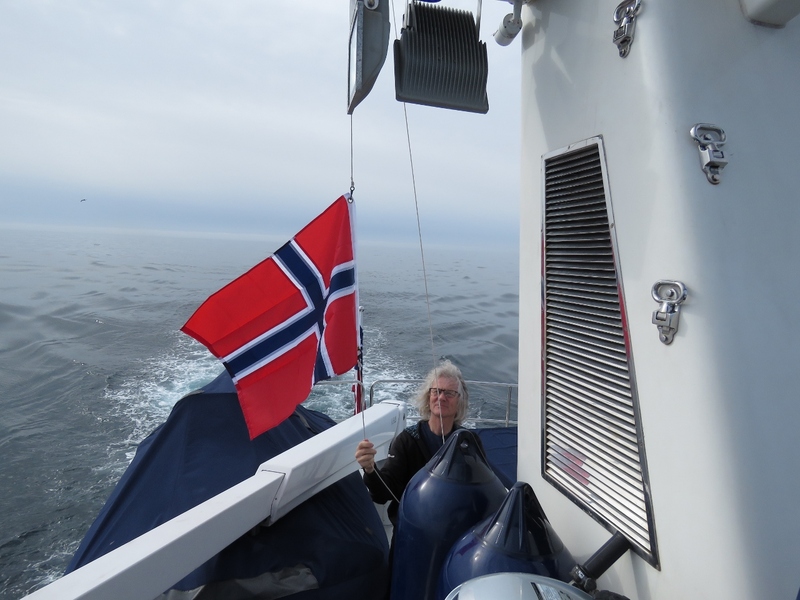 Raising our Norwegian courtesy flag as we approach Norway. As you can see behind us, conditions remain wonderfully calm. Jennifer having a 10:30am breakfast of fresh fruit and a granola bar following her off-watch shift. To our southeast is Jutland Bank, where the famous World War I Battle of Jutland took place between Britain and Germany. The HMS Caroline that we toured in Belfast is the only surviving ship from that battle. 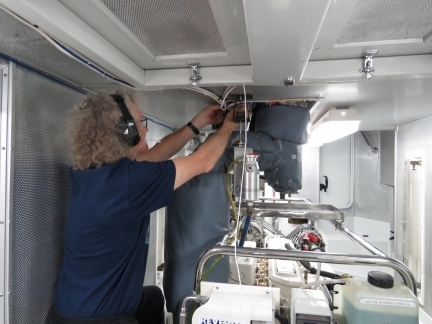 James installed a temperature sensor on the exhaust cooling fan. If the fan runs in reverse again, the quickly rising temperature at the fan will trigger an alarm before parts are damaged. Instead of the 15-20 kts that were forecast, the wind has shot up to 25-30 kts over the past few hours. The seas are big and tight on the bow and we’re pitching 20.5°. This isn’t dangerous, but conditions are more uncomfortable than expected. We have to be careful moving around the boat and when opening any lockers. Conditions are far from great, but are starting to settle down as we near the Norwegian coast. We’re now pitching “only” 17.9° instead of our earlier 20.5°. Our initial plan was to run offshore for a few more hours to Espevær, wait for a small system to pass, then continue running offshore while the weather held until we reached Tromsø. From there we’d work slowly south. 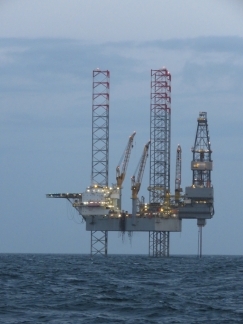 But the miserable conditions of the past few hours had tempered our desire to run offshore. 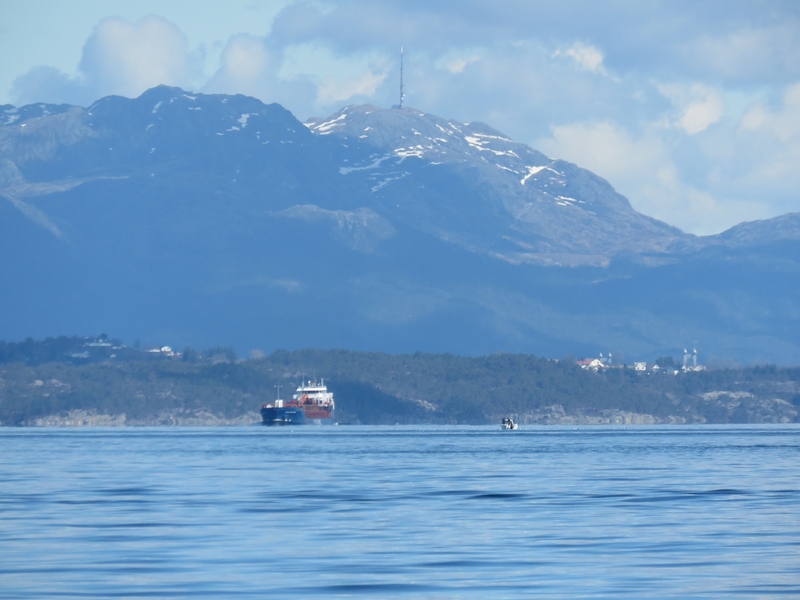 So when Bergen resident Trond Saetre encouraged us to run inshore and even plotted a recommended route, we didn’t have to think hard about it. We adjusted course from outside the island of Karmoy to inside and are looking forward to some sheltered coastal cruising. Thanks Trond. Our first view of the Norwegian coast just past 5am. 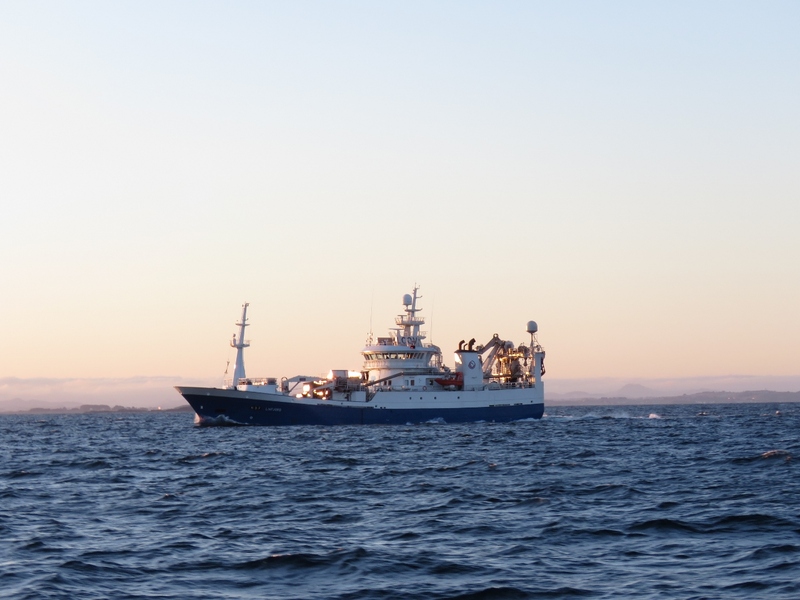 The Norwegian trawler Liafjord aglow in the morning sun just west of Stavanger. 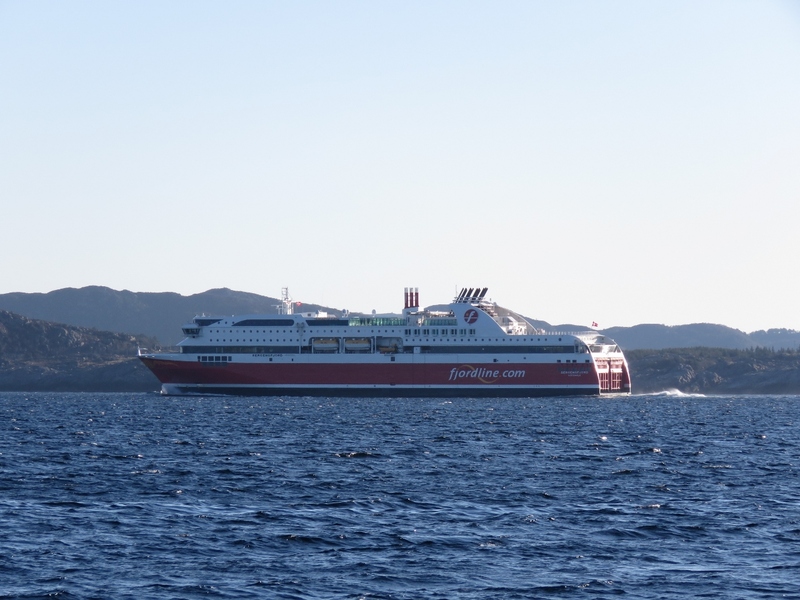 The 557-ft (170m) cruise ferry Bergensfjord en route to Bergen after an overnight run from Hirtshals, Denmark to Stavanger, Norway. 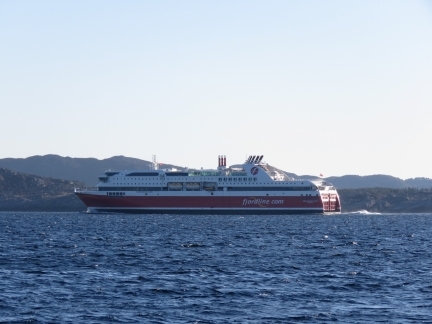 The Bergensfjord and its sistership Stavangerfjord, owned by Fjord Line of Norway, are the largest cruise ferries in the world to run entirely on LNG. 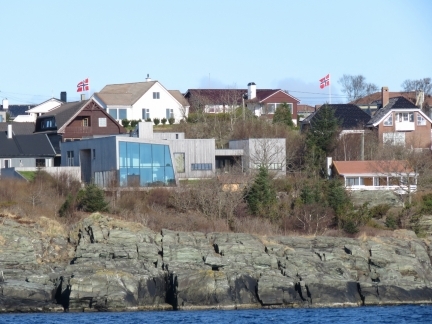 Many striking modern houses overlook the strait of Karmsund along the east side of the island of Karmoy. 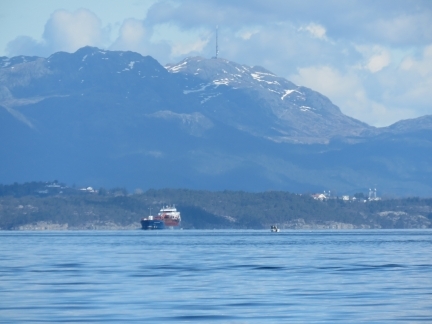 The oil industry drives much of Norway’s healthy economy and we’re seeing plenty of evidence here. 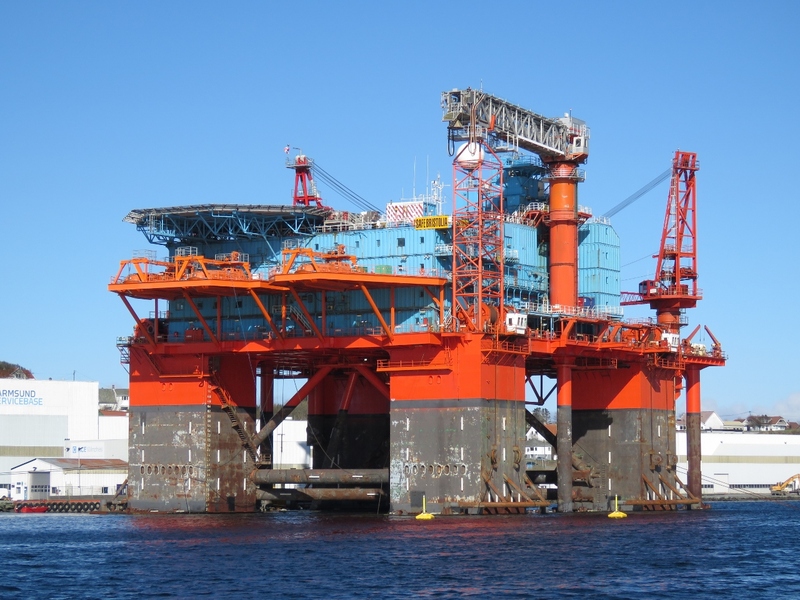 The 423-ft (129m) Deep Endeavour is one of several capable-looking offshore supply vessels that we passed. The LNG carriers Gulf Energy and Bering Energy have been here long enough to be visible on the satellite imagery. 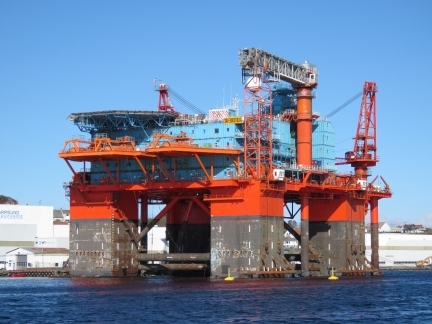 They are owned by South Korean shipowner Sinokor Merchant Marine. Passing under our second bridge in a half-hour. Norway has excellent infrastructure, including many, many bridges. 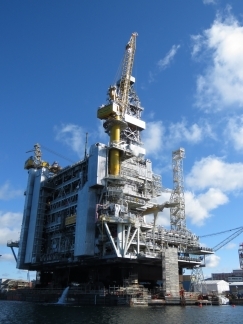 A large oil rig that looked to be in for a refit. This oil rig appeared to be under construction. A small taste of the fabulous scenery we’re expecting to see over the next few months. 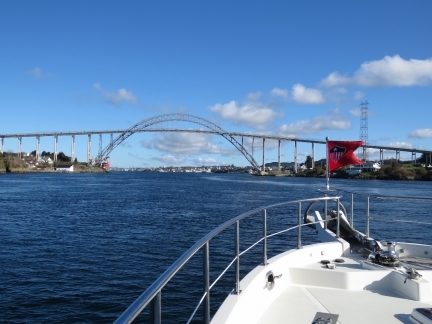 We tried to anchor at scenic Buavagen, but the holding was poor and the swing room tight, so we continued on. We’re all out on deck to enjoy our first stop in Norway at Vorlandsvagen. This is the first country we’ve visited where we didn’t have to complete any clearance formalities. We already cleared into the Schengen Area in Harlingen so no further immigration clearance is needed to enter Norway, also a Schengen country. And Customs didn’t require our contacting them on arrival if we had nothing to declare and the boat would be in the country for less than six months. Hi James and Jennifer, continued thanks for your continued efforts to create this treasure trove of value. Hope you’re done with pitching and rolling for awhile now. 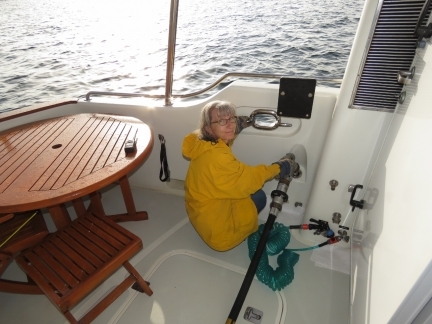 * Do you always use a straight pipe type end on the nozzle of the shore side fuel hose or do you also have a fitting on your fuel fills for a clamp on style connection between the boat fill and the hose? 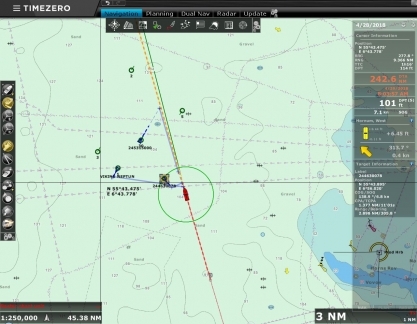 * what size ID would you think ideal to handle all the various fuel nozzles you run into around the world? * if your fuel fill was inset into a locker, how much space above the fuel fill do you think you’d need to have to accommodate the different size fuel nozzle heads you encounter? * what is the ID of your fuel tank vents? 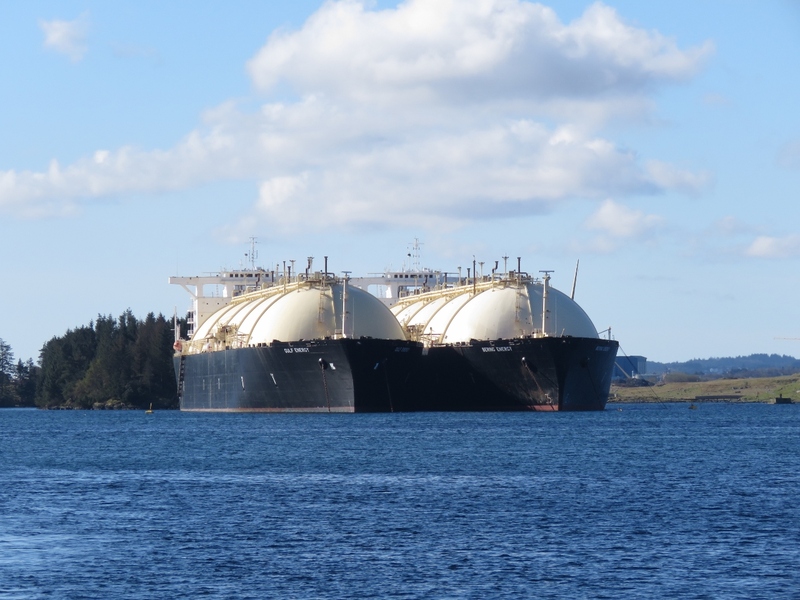 We have done our share of bunkering around the world on our previous boat but we only carried about 800 US gals total so the volume was not as much as it will be on this new boat and hence my curiosity on what your experiential learning has taught you. Thanks in advance for your thoughts and ideas. That sounds like an exciting project. It would be fun (but probably tiring) to build a boat where you get to make every design decision. The fuel inlet and venting system on Dirona is unmodified. It’s acceptable but it’s not what I would choose if I were making the choices. Dirona has 2″ fuel fills that go down and forward to the side tanks. The vents are 1/2″. We usually fill with a 1″ nozzle and can fuel at about 70 liters per minute. Higher rates will backup in the fill nozzle. Ideally you want the fuel inlets to be as directly into the tanks as possible. Ours go forward which slightly constricts flow. Many use cam lock fittings which can increase flow greatly by avoiding backup in the fuel fill neck. Ideally the vents would be much larger. I worry slightly that camlocks on a 2″ inlet could over pressure the tank and would prefer a larger opening. Most fill locations don’t have camlocks so you need to be able to accept a straight nozzle. The nozzles used all over the world vary greatly. Some have quite large diameter openings but just about everyone has a smaller adapter we can use. Because the adapters are used less, they often leak but we manage. Most hoses are around 2″ but, in Mauritius they used 4″ hose with an adapter on the end but no valve. We always found ways but some are challenging. If you use a fuel locker make sure you have clearance around it for very large and very stiff hoses and sufficient room above the filler to allow up to 2′ straight nozzles to fit in. Generally I would prefer to not have a locker and have the fills in as open an area as possible. Is using a locker ensure as much clearance as you can get. 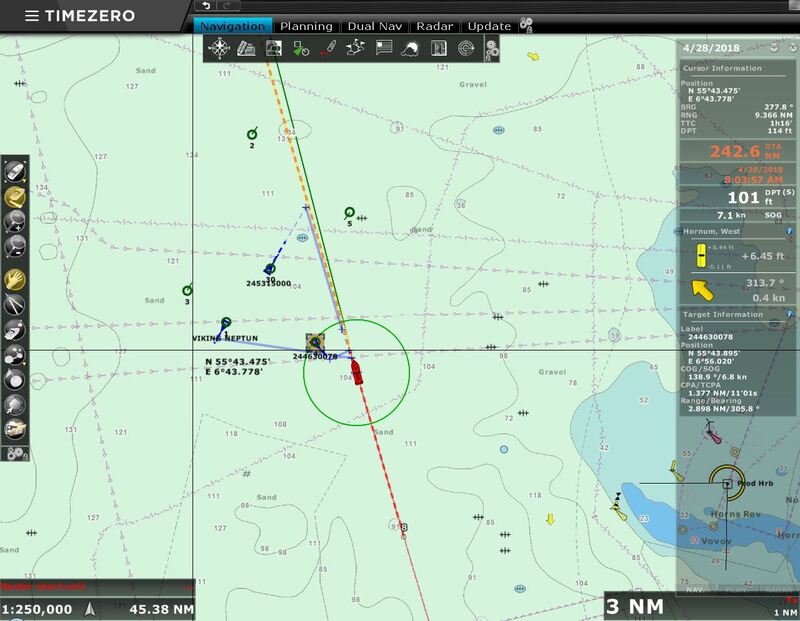 Depending upon tank location, using a central fuel locker might lead to more convoluted fill pipe routing which you really don’t want. Make the flow into the tank as close to straight as possible. Even slight bends really slow things down and make it more difficult. Try to get the vents much larger than our 1/2″. Perhaps an 1″ but, the number one most important thing is to ensure the vents can’t every take water. Put the vents where you can’t get water, can’t get wave pressure, and run the hoses as high as you possibly can above the vent. Thanks so much for sharing your thoughts and ideas on fuel fills James, much appreciated! Building a boat is certainly a challenge but that’s part of the appeal for us and the kind of challenge we like so working very well for us so far. I’m sure there will be days when we ask ourselves WTF were we thinking?! But we treat that the same as we do running into storms at sea, this too shall pass and it is getting through such challenges that provides such a boosted reward when we are enjoying sunsets from the aft deck. 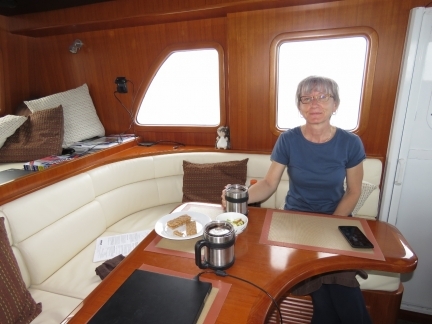 Really appreciate your dimensional specifics from your experiences to add to ours over the past few decades of sailing. It is the larger capacity of fuel now that we are going to be voyaging under power rather than sail that is the new part for us. The fuel filling system we’ve collaborated with our builder on exceeds all your suggestions which is great confirmation and should give us a fuel filling system that works very well. Our smallest ID in the fuel filling plumbing is minimum 50mm and we’ll likely go larger when we get to fabricating these and we have two fills on each of the 6 tanks that are minimum ID of 25mm so able to vent as if 50mm so should be plenty for venting high volume fills with the larger camlock fuel fill nozzles we run into when bunkering. We are building separate vent boxes and fill boxes and each is sealed off from any water access and made to stay dry even during a self righting roll over so they will stay nice and dry pretty much no matter what. We are then running a large vent pipe from the vent box back to the Day Tank which enables us to have any spills or over fills self drain back into the Day Tank and gives us a single large vent from the Day Tank which will have a shut off valve on it for when we are leaving the boat for lengths of time or on anchor for long times which we often are. This cuts down the humidity in the air spaces in the tanks and helps a bit with any condensation, although we also have an Alpha Laval MIB303 centrifuge type fuel/water separator and polishing system so we will regularly remove pretty much any accumulation of water, tar, dirt and have extremely clean fuel all the time. Overkill for some I’m sure but when you live aboard full time and spend most of your time as the only boat in the bay these things become key to being as self sufficient as you need to be for such a use case. 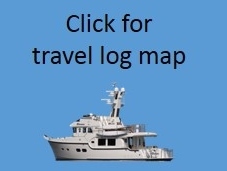 Thanks again for great generosity of your time in answering all these “little” questions and sharing your journey both geographically and boat wise. 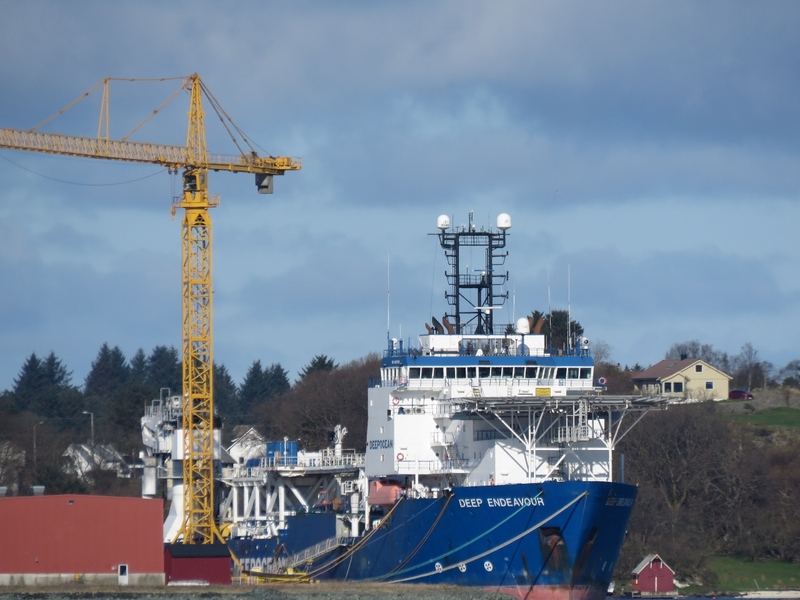 Hope we are able to share an anchorage with you after we launch Mobius to thank you in person and share some stories. Sounds like a super fun project and your plans around fuel fills and venting sound excellent. The only thing that I might recommend is don’t underestimate the value of fills that go straight into the tanks. Central filling is nice but straight pipes are even nice. If you can get enough diameter, then it won’t matter and you may already be there but that would be the only thing I would look at more closely. Best of luck on what is an exciting projects. As we have a fur baby ourslves, I have to ask! Does yours ever venture of the Dirona? He’s not allowed off the boat and is pretty good about following the rules but there is the odd temptation that he can’t pass up so we keep a close eye on him. When he is outside, we watch him closely. If he does make it off the boat, it’s not for long.